The decision to put down your horse is never easy. CUHA's resources along with advice from your veterinarian can help you through the decision-making process and ensure you find a euthanasia solution that is compassionate and humane. If you are considering euthanasia, the following are some questions to consider about your horse. Is the horse’s condition chronic, incurable and resulting in unnecessary pain and suffering? Does the horse’s condition present a hopeless prognosis for life? Is the horse a hazard to itself, other horses, or humans? Will the horse require continuous medication for the relief of pain and suffering for the remainder of its life? If the horse is suffering but treatable, is proper and recommended care of the horse within the means of the owner or rescue/retirement facility, such that the health and safety of the other horses is not compromised? Is the horse constantly and in the foreseeable future unable to move unassisted and interact with other horses. Is the horse exhibiting behaviors that prohibit a decent quality of life? If you answered yes to any of these questions, the humane thing to do may be to euthanize. A licensed equine veterinarian can help you make this decision and discuss options for humane end-of-life procedures. 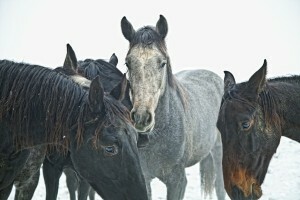 Additional information to help equine organizations and rescues care for horses can be found here. CUHA promotes the humane treatment of horses, throughout their entire lives.